Crystal USB Flash drive and Gift box sets. 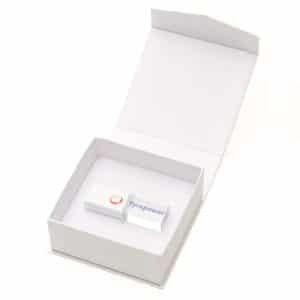 Crystal USB Flash drive & Gift box sets create the ultimate experience for your clients. There are several colour options Rose Gold, Gun Metal or White with the crystal body. We stock all of these colours in our Brisbane office and can supply other colours on request. 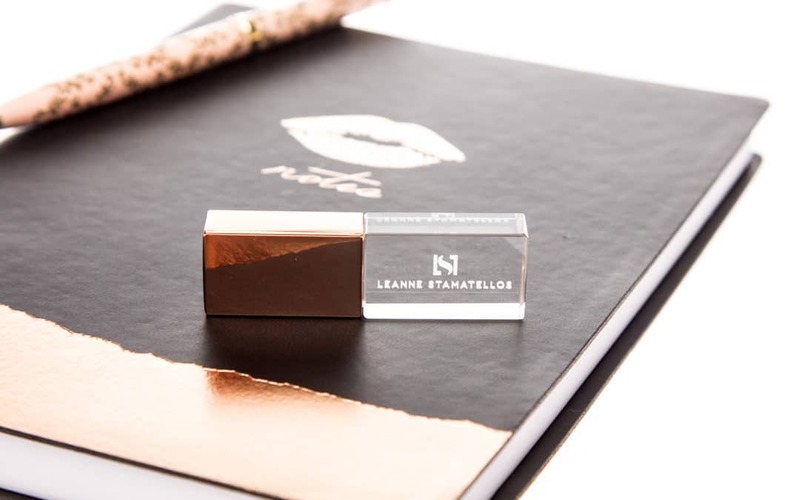 Choose from a colour printed logo (minimum quantity 10) where you can feel the logo printed on the crystal part of the USB flash drive or a beautiful laser engraved embedded logo. The laser logo is visible through the crystal and looks amazing. Minimum order is 25 for the engraved option and is our favourite look. To complete your look, consider one of the following Gift box options. Hinged lid gift box, has the option of a digital printed logo on the lid, it has an elastic holder inside the box to hold your crystal USB flash drive in place. Consider black or white depending on the colour of your logo, you may want a contrast to make your logo stand out on the white or black background. 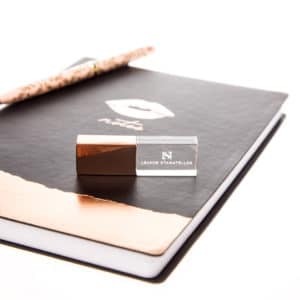 Base and Lid Gift box, has the option of a digital printed logo or a foil logo on the lid of the box. Inside this gift box has an elastic holder option to keep your USB safe and hold it in place. You can choose black or white inside both the black and white boxes, just let us know. 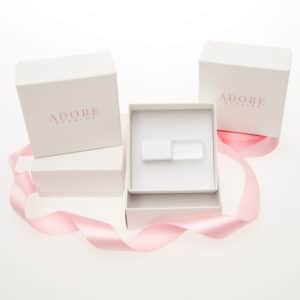 Our newest addition to our USB flash drive gift box range is the magnetic lid box. Available in black or white with a pinstripe textured feel to the outside of the box. The insert has the option of the USB elastic holder to keep your USB in place. A full colour printed digital logo can be printed on the lid of the box. Our USB flash drives are premium quality and come with a full replacement warranty.